Because of its 2.5 hour proximity to the masses in Vancouver and nearby ‘burbs, skiing peaks off the Coquihalla Highway (technically HWY #5) can be quite popular. Consider going on a weekday to have tours all to yourself. This section is in its infancy so we have limited routes listed—but that can change. 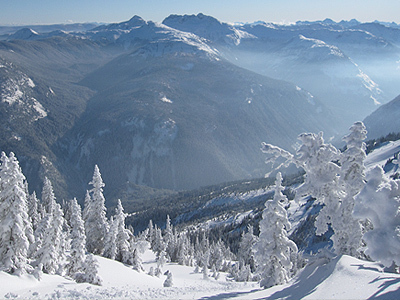 We want to hear about your adventures in the Coquihalla Highway region so don’t forget to post a trip report in the Backcountry Skiing Canada forums. If you have a new route in the area you want to share, mouse-on over here. The Thar Peak route was provided by one of our dedicated followers - thanks Powda Gangster. If we have missed anything please let us know. Other peaks in the area are Zoa, Yak, Nak and Needle—to name just a couple. Routes off the Coq, as it is affectionately known, are “highway lines” in that you can scope some of them driving by in the comfort of your vehicle. For an in-depth profile on backcountry ski touring options, pick up a copy of John Baldwin’s Exploring the Coast Mountains on Skis. This is a great tour with lots of options for great skiing. Nicely spaced trees with great fall line skiing. The best skiing is directly back through your uptrack which dumps right out to access road. There are great runs both west, south and east of the summit. If skiing southwest off the summit be careful not to get sucked too far into the drainage as the bottom is guarded by cliffs and it is easy to do because the skiing looks so good. If skiing from this side start trending skiers left at about 5000ft. 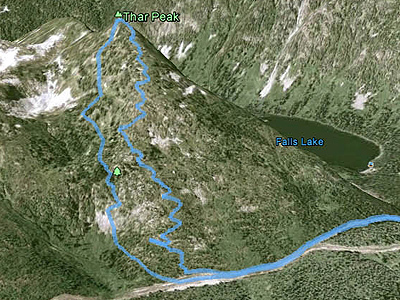 The top elevation of Thar Peak is 6330ft and this route covers 2.5 miles and is a reasonably easy 2.5-hour drive from Vancouver. ACCESS: Coquihalla Highway 53km from Hope BC, exit at 221 Falls Lake Road.